Seen in high rainfall zone after heavy summer rain. 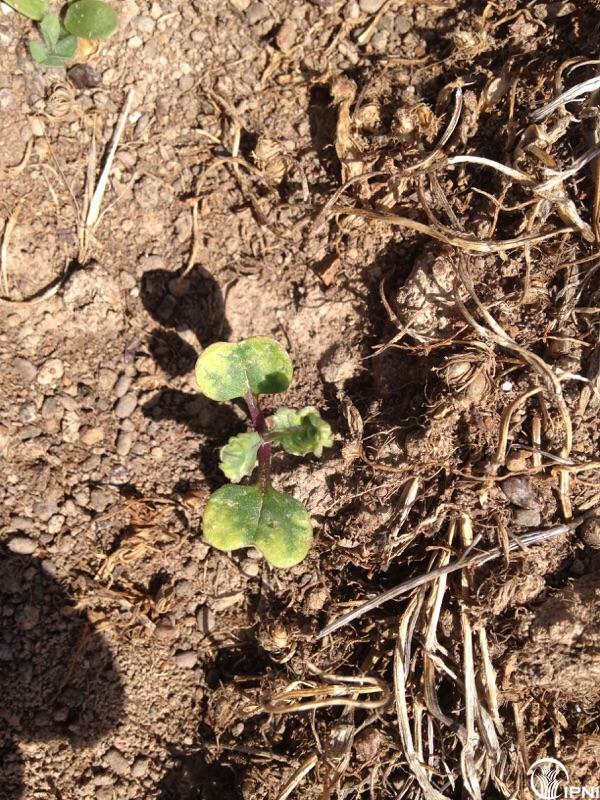 An early planting of winter canola in the Victorian western district - to be either grazed in the autumn or left through to grain. 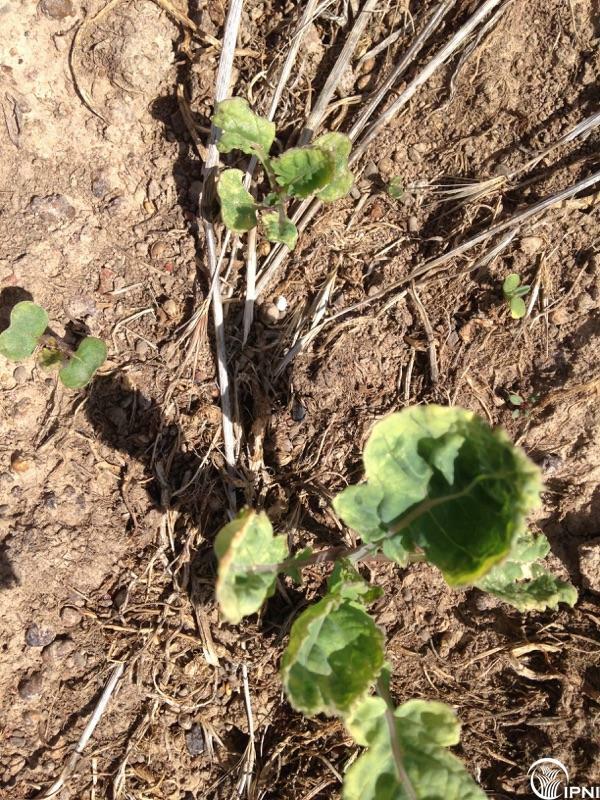 An inspection by Landmark agronomist Ed Hilsdon (@ehilsdon) showed the cotyledons and leaf margins turning yellow, varying from pale to very intense yellowing of the leaves (see images below). 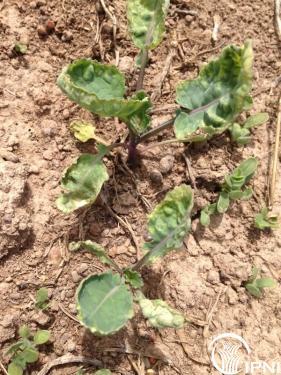 Leaf margins died and the crop was growing very slowly. The pH in the paddock as 5 (CaCl2) so was not particularly acidic, although it was on the brink for liming. 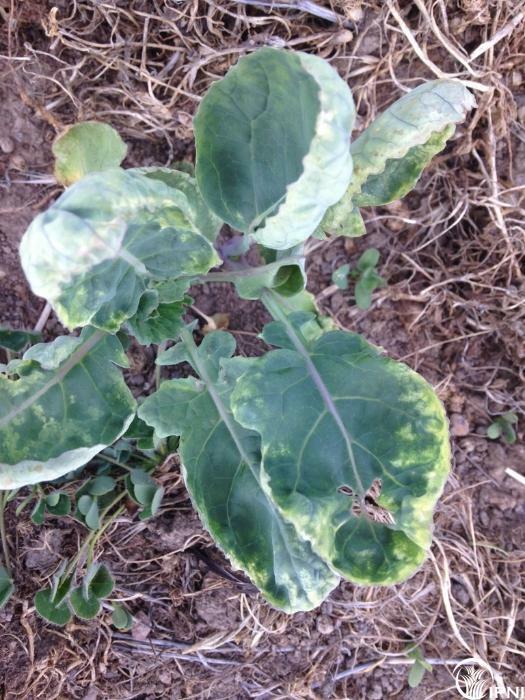 The symptoms appeared after a heavy summer rain and the soils were warm and wet. 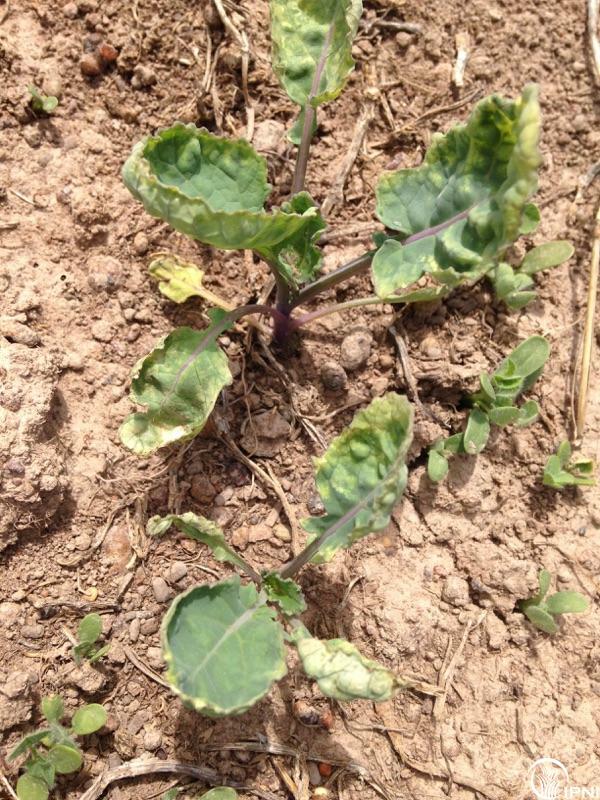 Ed took some tissue samples, which showed that all nutrient other than manganese were in the normal range - the plants without symptoms has tissue manganese levels of 410 mg/kg, while the poor patches had levels of 2,400 mg/kg. The symptoms were concluded to be associated with manganese toxicity. MANGANESE (Mn), one of the 17 essential elements, is mandatory for plant growth and reproduction. Manganese is considered a micronutrient because plants require only small amounts. This designation, however, is unrelated to its relative abundance in soils or its importance as a plant nutrient. Relatively large quantities of Mn can occur in soils, but only a small fraction is normally available at any one time. Manganese functions primarily as part of plant enzyme systems. It has a role in several important metabolic reactions, including the conversion of nitrate-nitrogen to a form the plant can use. Manganese plays a direct role in photosynthesis by aiding chlorophyll synthesis. 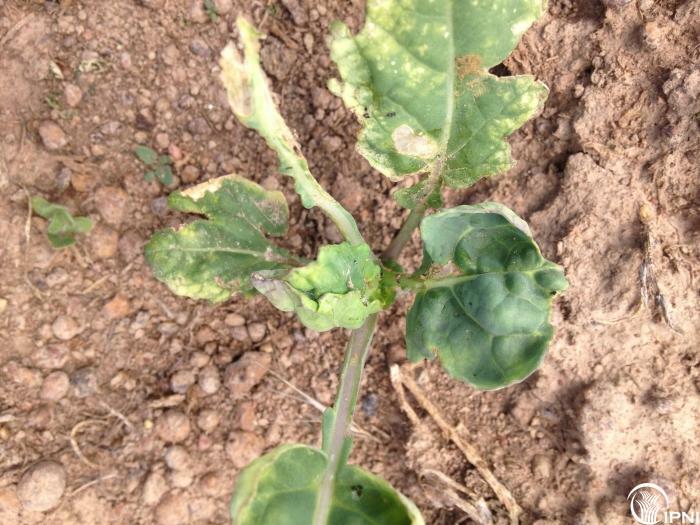 Because of this role, Mn deficiency symptoms usually involve leaf yellowing or chlorosis. Plants take Mn as divalent Mn2+ either directly from the soil solution or via contact reduction at the root surface. All factors which influence the concentration of divalent Mn will have an effect on the plant status. 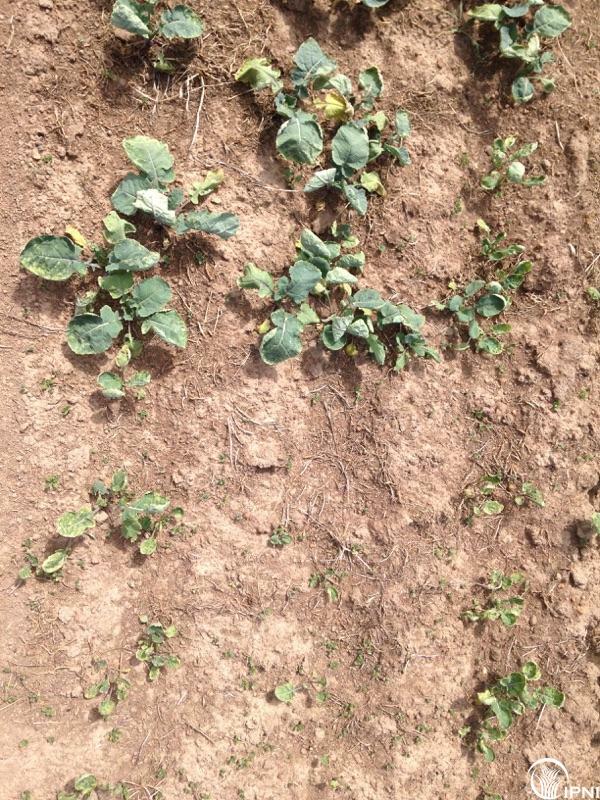 Even is a soil with relatively moderate Mn content, the availability of Mn2+ can increase dramatically where the soil becomes reducing through waterlogging especially under warm conditions - such as occurred in this situation. The patchiness of the crop is likely due to localised poor drainage in the soil itself. So what to do - wait until the soil dries, and the reduced Mn will likely become oxidized back to Mn oxides and so the availability to the plants decrease. Lime next time the paddock is out. If you have questions like this - use eXtension - Ask An Expert - see link at left.